Cats have different personalities. Here are seven distinct personality types. 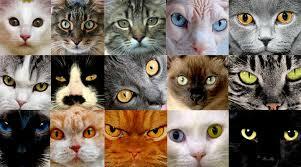 Which one does your cat fit? My cat Millie falls into the first category. She is extremely skittish. If any of us enter the room whiles she’s eating or pooping or whatever, she quickly leaves the area. If we receive any visitors, she retreats to the back room. She also qualifies as the hunter. If there is a mouse in the house, leave it to Millie to track it down! Molly, who passed away over a year ago was the cuddler. She loved to sit on my lap or sleep next to me in bed and snuggle up. She also was sort of needy. She clearly let me know when it was time to eat, get brushed, go outside with me etc. Can you decide what categories your cat falls into? This entry was posted on Wednesday, April 17th, 2019 at 9:06 am	and is filed under Pet Supplies. You can follow any responses to this entry through the RSS 2.0 feed. Both comments and pings are currently closed.